This is the most noticeable, and common sign. Acids from the mouth slowly melt away the very hard enamel layer of the tooth. Teeth will thin out and feel very sharp, and chip very easily. 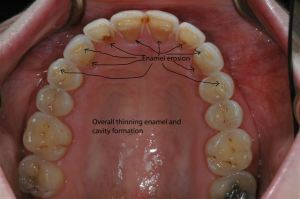 If this condition is continued for long periods of time, erosion will also affect the back teeth. Serious issues like tooth decay and damage to the nerves of the teeth is a likely scenario. Eventually, as the biting surfaces melt away, the jaw will get misaligned -- leading to serious jaw and facial pain. all the time. Plus, the acid will also damage the delicate gum tissue by receding and exposing the roots of the tooth, causing further sensitivity. and this eating disorder must be controlled before any dental treatment. So far, there is no way to grow lost tooth structure, although scientific advances may make it possible in the future. For now, options are limited to restoring what was lost with either porcelain veneers or bonded composite fillings. It all depends on how much of the tooth volume was actually eroded away. Treatment may be as simple a few small fillings or as complicated as placement of numerous porcelain veneers or crowns. At times, full-mouth veneers may be required in order to resurface the lost tooth structure and reestablish the correct bite position, alleviating any jaw, facial pain and headaches that may have resulted. It's important to understand that this disorder must ultimately be controlled with behavioral modification and a support group that is empathetic and understanding, or else any dental treatment will fail.